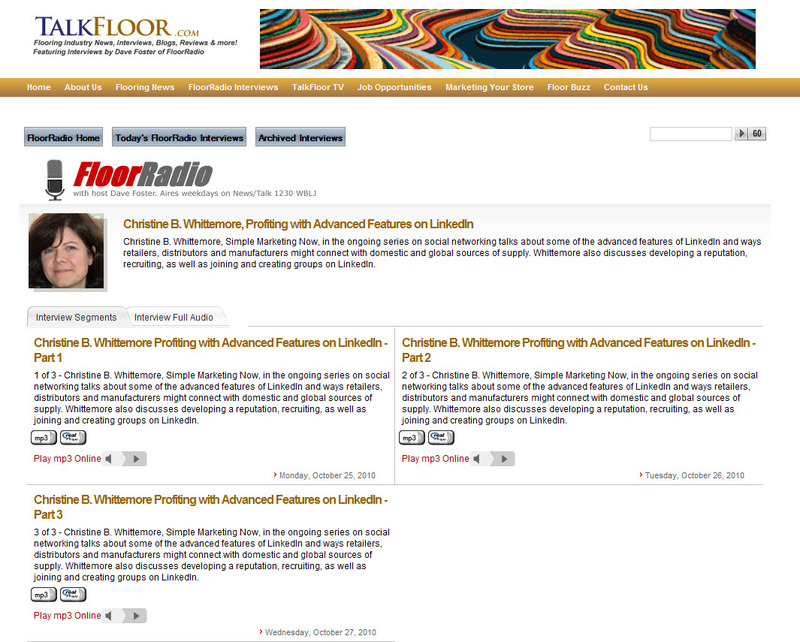 The conversation about LinkedIn continues on the TalkFloor social media marketing interview series with Dave Foster. In part III, we examine LinkedIn business successes - practical examples of businesses using LinkedIn. The TalkFloor interview is in three parts and aired October 25, 26 and 27, 2010. Dave and I are both on LinkedIn, so please do connect with us: Dave Foster and Christine B. Whittemore. What follows are my show notes. The best uses for LinkedIn involve connecting with others – to build your reputation, recruit or make contact with, to do market research with, to establish thought leadership and generate new business with down the road. It’s a network of people, more specifically business professionals. LinkedIn is not the best source of mass consumer leads. It is, however, a valuable B2B source and will connect with you professionals from around the globe allowing you a rich source for networking. LinkedIn is a powerful social networking platform as we discussed in the last session. It's considered the #1 resource for marketing your business. peers to consult with in a non-competitive environment. valuable for B2B or commercial relationship building and to supplement/reinforce the networking you do at Chamber of Commerce meetings and other local groups. Offer value based on your area of expertise. As important as it is to fully understand your own company and products, if you want to connect with others – find commonality, develop a relationship, engage in conversation with them – it’s equally important to think beyond products to solutions. You may be in the flooring business, but you also deal with business processes or marketplace issues that are relevant to other business people. Perhaps, too, your product fits into a bigger solution: flooring is part of a building, for example. LinkedIn offers those who participate in LinkedIn Answers the opportunity to accumulate ‘reputation points’. To build your reputation via LinkedIn, take a topic of interest and knowledge to you. Maybe it’s environmental sustainability or time management. Search for groups related to your category => participate. Thank privately all those who comment and express interest. Be consistent about sharing, have a theme. Is it all related to sustainability? Or is it sustainability in your town? Or related to one product? In terms of case studies for recruiting, just about every company has turned to LinkedIn for recruiting. Either for hiring leads or to supplement candidate research by searching on specific keywords and connecting with those who have an interesting and relevant background. So, be prepared! Another valuable idea with long term benefit is to create a group that brings together people with common interests – perhaps around a cause – and interesting backgrounds that may relate to your field of interest or expertise. + By inviting them, you make them feel good. + At some point down the road, this might be a group that you hire from or pull from for additional activities. + By creating such a forum, you create goodwill and readiness to help you when you need the help. + Marvelous example of this is the #prstudchat group which supports a weekly PR student chat. The group is robust, active, further discussing ideas presented during the Twitter chat and representing talented young PR candidates. NOTE: remember to moderate and manage your groups. Don’t forget to set rules for behavior. Develop the relationships first. Once you’re active in LinkedIn groups and answers, you’ll find that you can seamlessly turn to the relationships and goodwill that you’ve built for other purposes. Given the tools that LinkedIn makes available for asking/answering questions and engaging in discussions and conversations, don’t overlook LinkedIn as a source of valuable market research and insight. For example, in the groups you’re active in, post a request/invitation to participate in your research. Create an event [i.e., a research event] and invite others to the event. Be sure to have a series of messages prepared explaining what you’re researching, thanking for participation. Etc. Be sure to mine existing data on LinkedIn including existing Answers. Read through relevant group discussions. Connect with those whom you find insightful. This one is near and dear to many of us as we try to figure out how to reach more customers, right? The New York Times recently featured a Canadian entrepreneur who sells equestrian luggage. It’s called Red Scarf Equestrian. She credits LinkedIn for building her business because it allowed her to expand beyond Canada. How: by searching on relevant terms, finding groups related to her product category and building relationships. As with building your business offline, this happens gradually over time. It supports all of your offline or in-person activities and it allows you to connect in a way that overcomes location, makes the most out of the relationships you’ve built throughout your career. Make a habit of spending 20 minutes a week on LinkedIn. Add a reminder to your Outlook calendar to do so. Same as with networking offline: Start building relationships and establishing your reputation now so you earn enough social capital to make sales pitches down the road more acceptable. Before heading off to Surfaces, do a LinkedIn search on some of the people you will be meeting with. Bring that information up when you meet. Observe what happens. Please, let me know if you have any questions and also what you find most valuable as you create business successes using LinkedIn. Thanks so much. I'd love to hear what successes you uncover as you get further immersed in LinkedIn.